Summer isn’t everything because winter sports are here to stay! When people think about sports ribbons, they tend to think about track and field or swimming. However, winter is about to prove something to this trend. From skiing to figure skating, these winter sports athletes deserve award ribbons too. From skiing to snowboarding, some athletes are all about the fluffy whiteness called snow. And, while it may be a bit cold, snow is a great thing to play and compete in. 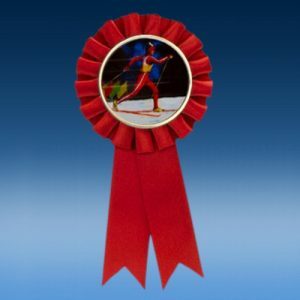 So, for your favorite skier or winter athlete, find the best award ribbon with us. Even if the award is for best form on a sled, each athlete should be acknowledged for their talents. 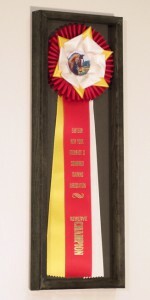 Rosettes are the most common of ribbon awards for any sporting event. Skiing, bobsledding and other winter sports are no exception to these awards. 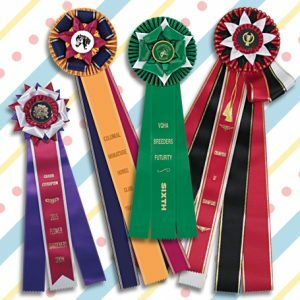 With the fancy rose and button features, these award ribbons are perfect for recognizing any sporting achievement. 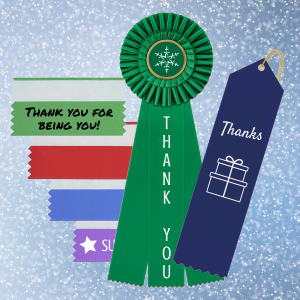 Simply customize the ribbon streamers with recipient names, titles and even small graphics. And, you can choose from several colors to match the ribbon to the sport. Don’t forget the other award ribbons! 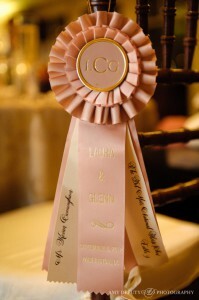 Award ribbons can be merely a flat piece of ribbon, such as a badge ribbon, or a fancier use of a ribbon material. 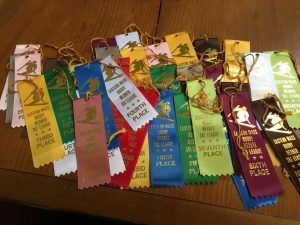 Each award ribbon is commonly presented as a prize or other mark of recognition to honor the recipient for an achievement. Even more, award ribbons come in all shapes and sizes. And, each type of ribbon can be used for multiple purposes. Whether an award is being presented at a sporting meet or just for fun, every award should accurately reflect the achievement. 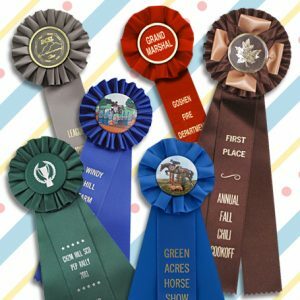 Ribbons come in stock placement and participation titles. Or, customize your ribbon choice to meet your current needs. 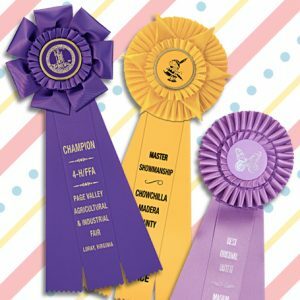 Use titles such as “Best in Show” or “Perfect Athlete” for your award ribbons. And add your favorite graphic or logo to each ribbon, so the athlete remembers what the ribbon was for. And, don’t stop there. 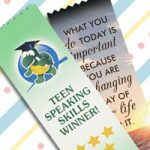 Try these award ribbons for any sport or other achievements you can think of. No matter how you look at it, ribbon survival kits are something everyone should have on hand. For many people, using personalized ribbons is a common practice during the holidays. From wrapping presents and decorating for a holiday party to corporate gifting and business branding, ribbon survival kits are a crucial tool to have on hand for the holidays. So, why are these ribbon survival kits so essential? Here are our top products and why they are useful for any holiday celebration. Don’t underestimate the power of a rosette! These extravagant ribbons are useful for all ribbon survival kits. From unique name tags for gifts to prizes awarded at any holiday party, rosettes are a unique ribbon to keep on hand. We guarantee that there are many unexplored uses for rosettes, so don’t let these ideas limit your use for this ribbon type. Personalize any of these rosettes with text, logos and other details. There are options of one, two or three streamers with one color imprinting. Each center button comes as cello, gold-rimmed or satin. Add names, titles and holiday messages to the streamers and customize the button to meet your needs. With all of the available customization options, these fancy ribbons have endless uses! So, grab some rosettes to put in your ribbon survival kits today. 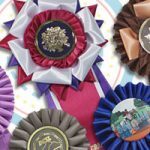 Choose from a large variety of stock award rosettes or create custom ribbons to match all of your holiday needs. 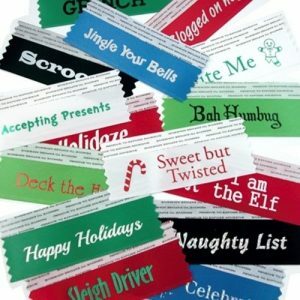 Badge ribbons provide identification and add fun to any holiday event. Personalize badge ribbons with custom text and a logo or small graphic. 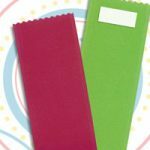 Identify party attendees by attaching a ribbon to a badge holder or clothing item. Or use them as party favors, gifts, decorations, party table scatter and so much more! From fun holiday titles for employees at a business luncheon to silly games at a family party, badge ribbons are the perfect tool for your ribbon survival kits. Add nearly any text to each ribbon. And, with fun, festive color choices, your possibilities are almost endless. Oh, and ribbon rolls are a must in any survival kit! There are so many uses for ribbon rolls that the list is endless. Customize each roll with names, dates, titles, quotes and so much more. Choose your favorite holiday color and go crazy with any customization you want. And, make sure to share your projects with us. Ribbon survival kits aren’t just for you. Create one for your colleagues and neighbors as they make perfect gifts for the holidays. 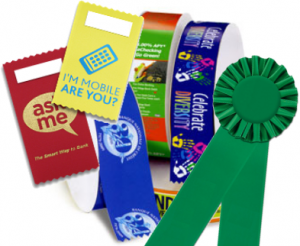 From logos to company names, product marketing ribbons are a must for any business. 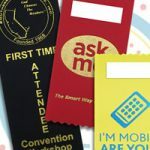 Custom marketing ribbons are a great way to advertise your product or services. These ribbons are used to add decorations to packaging or promote a new product. And, when you add custom text and company logos, marketing takes on a whole new level. Here are some useful ideas to get you started with product ribbons. From gifts to giveaways, custom ribbons have been around for a while. And they are easy to use with a box or bag. 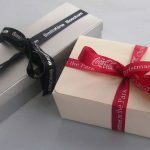 Simply wrap a length of custom ribbon roll around a product box to show off your corporate branding. Or, attach a bow or badge ribbon to a bag to explain what your product is to your consumer. But, no matter the ribbon type, custom ribbons are genuinely perfect for wrapping. 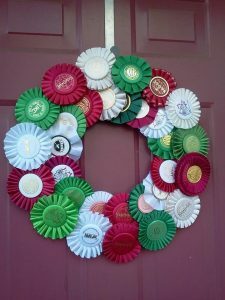 However, here is a new idea: try a rosette ribbon to add some class. Did you know you can customize the button in the center of the rosette? Add your logo or a graphic that represents your company. Roses, daisies and cookies all look great wrapped in custom ribbons. 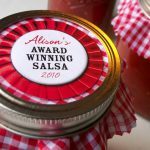 Add personalized marketing ribbons to your fresh products for a unique look. You can even add printing describing your product to these ribbons. Your custom ribbon rolls can read Chocolate Chip or Long Stem, White depending on what you are selling. Or, wrap a bouquet with custom ribbon stating your company name and logo, so your customers know where to return when they need more flowers. And, by adding custom text or logos to baked goods, your branding will bring in new customers as they see others consuming your products. So, never underestimate the power of marketing ribbons! Use badge ribbons or ribbon rolls to find a creative way to display earrings, sweaters and more at your store. 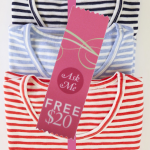 From a local boutique to a larger chain store, customize a ribbon to meet your needs. 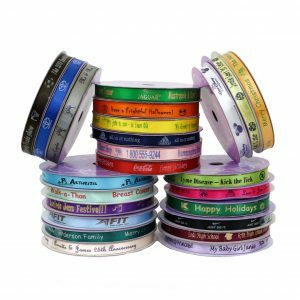 Personalized ribbons create an appealing presentation for any product. Marketing ribbons help attract needed attention to your products, and they will also increase brand recognition. It doesn’t matter if you work at a large chain store or your local farmer’s market, these ribbons are for everyone. Remember that when it comes to proper branding to choose coordinating colors, text and logos. And, make sure to pick the right ribbon for your need. So, whether it’s a shoebox from a big brand name or a bouquet from a small, local shop, product marketing ribbons are sure to help you get your sales up!